A tyrannical “man child” who will rule the earth? A disintegrating world order based on the man child’s home country? A malevolent, powerful “beast speaking great things and blasphemies?” Widespread drought, plagues, and poisoning of the environment? “In one hour, so great riches…come to naught?” Wars, aggrieved masses, fire from the skies, and a climactic battle at Armageddon? I’m on the Greek isle of Patmos, my mind aswirl with thoughts of Trump-induced doom. Light from the early morning sun shimmers off the Aegean, turquoise and foam-frothed far below, and casts, through a small rectangular window, a glowing, narrow copper beam into the smoky gloom of the grotto church; flames quiver in the silvered candelabras and on the chandelier, glinting off the gilt iconostasis, which in its sovereign tier displays mournful depictions of Christ the Pantokrator (Creator of All) and the Virgin Mary. Enrobed in a white cassock emblazoned with gold crosses, the priest swings his thurible, its tiny bells tinkling, and disperses the heady aroma of burning frankincense throughout the nave. These days more than ever we find ourselves in need of mercy and salvific promises. The priest’s chants — baritone, mellifluous, and haunting — dispatch me into reveries about the almost two millennia that have elapsed since a Christian named John purportedly reclined in this very cave, here on this tiny, far-flung island, and suffered extravagantly narrated visions of supposedly divine origin that would constitute the colorful, almost lunatic-sounding eschatology recounted in the Bible’s final book. Tradition ascribes the text, composed in Biblical Greek in the second half of the first century, to John the Apostle. John the Apostle, though, might not have been the John who claimed authorship. Whoever he was, he told of “things which must shortly come to pass” — worldwide convulsions and chaos that were to culminate in the Second Coming. John gave no indication that things would drag on for almost two thousand years; his was a warning suffused with a sense of urgency. But with Trump now in the White House, a sense of urgency, of impending peril, even, has indeed permeated the lives of many of us, and gives new significance to a text that, in modern times, enlightened humans would not otherwise take seriously. Just days after Trump won the presidency, I set out for Patmos, following a circuitous route via Athens and Lesvos that began in Moscow, where I live. Appropriately, disturbing omens beset the last segment of my voyage. In Pythagorio, a harbor town on Samos, an island to Patmos’ north, in the early afternoon of a sunny, breezy day, I hopped aboard the Anna Express — a small ferry that seated perhaps 50 people — for what should have been a brief, cheery trip to Apocalypse Island. The ticket seller, though, warned me that the Anna would take more than the usual three hours to reach Patmos; it had to deposit Greek soldiers on islands off the usual route. Why? In case of war with Turkey, visible from Samos just across a narrow stretch of sea. Turkish President Recep Tayyip Erdogan was publicly disputing the 1924 Treaty of Lausanne that awarded some of the Aegean islands to Greece, and Turkish fighter jets were rip-roaring through the sky nearby, flagrantly violating Greek airspace. Grim, khaki-clad commandos filed aboard the Anna Express, tossed their automatic rifles in a messy pile, and sat in silent, glum rows. After some delay, we chugged out of Pythagorio. The breeze in Pythagorio became a gale at sea. We sailed athwart the wind, through a violent Aegean, lurching starboard to port, fore to aft, in our seats. But soon we were maneuvering between islands — Agathonisi, Leipsoi, Arkoi — that looked like run-of-the-mill rock piles, with no poetic fancy about them. I kept mentally quiet. We soon turned straight into the wind, crashing through six-foot waves and casting up torrents of foam, now and then drawing into tiny piers, at which soldiers grabbed their weapons and jumped ashore. It was November, so night fell early, which calmed the sea, leaving us navigating among dark, stony leviathans rising against a starry sky. When, finally, we pulled into Patmos’ pier at Skala town, hours late, I and one other passenger hopped off in silence, briefly wobbly-legged on solid ground. With the black bulk of barren mountains looming above and the sea spreading into stygian infinity beyond, it seemed entirely fitting that Patmos was the birthplace of epochal prophesy. I set off for my hotel, walking alone through dimly illuminated streets, among whitewashed houses that glowed coldly in the starlight. Skala appeared almost deserted. (The entire island hosts only around three thousand permanent residents.) 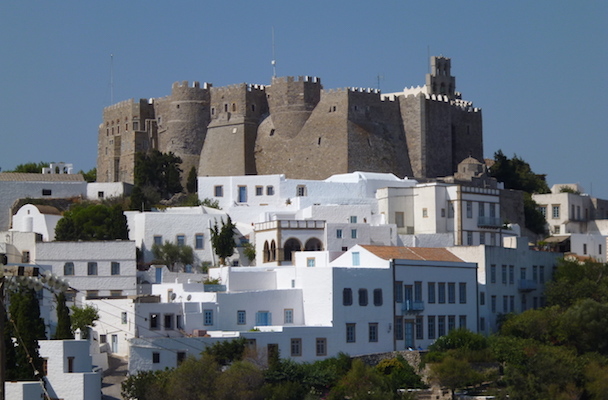 November is dead season; in warmer months, Patmos bustles with Orthodox pilgrims. High above, on a mountaintop, loomed the crenellated, eleventh-century ramparts of the Monastery of Saint John the Theologian. What better place to contemplate the Apocalypse than Patmos? My hotel room stood somewhat above much of the town, with windows affording me a vista of darkened homes, rooftops and sea. As I settled into my room, I thought about the Book of Revelation. In a convoluted way, it did appear to foretell Trump and the myriad disasters that seem destined to befall us. Even putting aside America, elsewhere, and especially in Europe, the portents of doom are multiplying: a gigantic, destabilizing refugee crisis, the rise of the far right, an intractable standoff with Russia and North Korea, and well documented harbingers of catastrophic global warming. Cause enough for a gnashing of teeth, a rending of raiment. And then, of course, there’s Trump. The next morning, with the Book of Revelation still on my mind, I took a taxi from Skala up a zigzagging road to the Cave of the Apocalypse. From the outside, it looks like a whitewashed church built into the mountain just beneath the Monastery. Once inside, it is clearly a cave. I noted how the indentations in the grotto where John allegedly laid his head and placed his hands have been ringed with silver. God’s voice — “a great voice, as of a trumpet” — is said to have issued from a fissure in the cave’s convex, bouldery ceiling, auguring ruin and resurrection. I won’t retell it all here. Instead, I’ll point out the parts particularly relevant in our Age of Trump. The prophesy is alarmingly specific, and begins with Ephesus (now Efes, a resort city with wonderful Greek ruins), languishing, back then, most pleasurably under the sway of a false prophet, “that woman Jezebel” who has taught the Lord’s “servants to commit fornication, and to eat things sacrificed unto idols.” The narration proceeds from church-town to church-town, with, of course, salvation and the “tree of life” eventually, after the Apocalypse, promised to the righteous. Many figures therein might be Trump. Could he be Death, riding the “Pale horse” and followed by Hell? Or might he be one of the “four angels, to whom it was given to hurt the earth and the sea.” None of these characters quite cut it. In any case, the seventh seal (of many), says Revelation 8, will be opened, and, at an angel’s signal, “hail and fire mingled with blood…were cast upon the earth: and the third part of trees was burnt up,” after which “a great mountain burning with fire was cast into the sea: and the third part of the sea became blood,” resulting in the perishing of “the third part of the creatures which were in the sea.” We can plausibly interpret this as a combination of nuclear holocaust (say, a war between the United States and Russia or China) and the after-effects of the Trump administration’s dismantling of environmental legislation. Maybe, though, as Revelation tells us, humanity’s quietus will originate in outer space, with “a star fall[ing] from heaven unto the earth.” Incendiary ungulates then ensue: “out of [the mouths of horses] issued fire and smoke and brimstone. By these three… was the third part of men killed.” One of seven angels, in Revelation 16, “scorch[es]I the earth with great fire” — further hints of nuclear war, and, potentially, disease spread by equines. John directly predicts our impending environmental catastrophes, with, angels (some angels!) spilling “a vial upon the earth; and it became as the blood of a dead man: and every living soul died in the sea.” Another does the same with the “rivers and fountains of waters,” scorching “men with fire.” Eventually, the “kingdom was full of darkness” and men “gnawed their tongues for pain.” An angel in Revelation 7, glumly utters, “It is done,” in “a place called in the Hebrew tongue Armageddon,” and sets off a catastrophic firestorm and earthquake. If the man child isn’t Trump, could Trump be the beast that rose “up out of the sea, having seven heads and ten horns, and upon his horns ten crowns, and upon his heads the name of blasphemy”? Not likely, though his mouth is as big “as the mouth of a lion.” This beast, however, essentially rules by blasphemy, so maybe it is Trump. The “great tribulation” and its attendant horrors may be fiction, but one line strikes me as true: “in those days, men shall seek death and shall not find it; and shall desire to die, and death shall flee from them.” In the event of, say, a Trump-ignited nuclear holocaust, survivors may well find such words prophetic, as they, in the frigid, ashen dark of a nuclear winter, endeavor to grow crops for survival on contaminated soil and drink contaminated water, grieving for their lost loved ones. Then ensues the “new Jerusalem”, the wondrously revivified heaven and earth, a cosmos without death or sorrow, and the Second Coming. Alas, in the real world humanity will have no such second chance. A few days after arriving in Patmos, I trek down to the port to catch the midnight ferry back to Athens. A wind blows, roiling the black waters of the Aegean. I join the small crowd huddled with their luggage and wait. The ferry, a mighty liner this time, announces itself with blasts of its horn, and pulls up to the dock, its engines churning the sea. We rush aboard. I will sleep well in my cabin, with my porthole affording me a starlit view of the nautical splendor that inspired artists from Homer’s day to ours. The next morning, so peaceful has been the passage that I won’t want to wake up. But I will, of course. And Trump will still have won the election.